Buy all your police gear online at CopsPlus.com. Selected mini flashlights can be fully protected in this compact, rugged, full-sheath style flashlight holder by Safariland. Available in plain, basketweave or gloss finish. For use with equipment belts up to 2.25" wide. Recommended for Stinger flashlights. Wish it was a bit longer. afraid the flashlight might fall out of it. Excellent quality and much better than the flimsy nylon holder I previously had on my duty belt. Securely holds my Strion while still easy to pull it out. My flashlight doesn't fit properly. I filled out the settings like it asked for. Looks and works as expected. Pros: fits most 1" body diameter flashlights (I use it for the Streamlight ProTac HL and cary bezel up). Bottom is closed and protects my light from AD Note if you have a Surefire G2, 6P or similar it may activate when you put it in the holster. Cons: Its leather, so it will require a little more maintenance than non leather gear. Bottom Line: Weigh you options when purchasing this light holster, I love it but your milage may vary. Fits perfect on my belt. Great material that will last long time. I want to order one of these for a #88040 Streamlight ProTac HL. 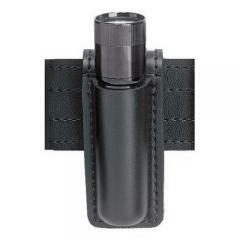 But the Safariland 306 holster choices listed do not include one for this flashlight. Please inform me which holster fits and I'll order the flashlight from CopsPlus also. The barrel diameter for your light is about 1" diameter. You will need to remove the clip for it to fit. "Streamlight Scorpion" would be the closest fit based on the dimensions. Does this actually come in Nylon? Safariland website doesnt list that option. It is available in "NYLON LOOK". The grain of this finish simulates and complements nylon, but is far more durable and abrasion resistant.